Blocks of chocolate made from raw cacao beans by Pierre Marcolini are then transformed into the exquisitely beautiful—and exquisitely delicious—bars below. PETER ROT was first schooled in chocolate by his German mother. After an epiphanic taste of Valrhona Le Noir Amer 71%, his passion for chocolate became a full-fledged scholarly pursuit. Peter is a moderator of a discussion forum of international chocolate connoisseurs and a reviewer for the international chocolate community. He is pursuing a graduate degree in the cultural significance of food. CAPSULE REPORT: THE NIBBLE’s chocolate expert visits one of the world’s great chocolate makers the way any connoisseur would—one chocolate bar at a time—and shares his tasting notes with us. This is Page 1 of a four-page article. Click on the black links below to visit other pages. While it’s tempting to dig into a gorgeous box of bonbons, chocolatiers should be evaluated by the quality of their bar the purest expression of their chocolate. Pierre Marcolini makes beautiful bonbons and truffles; but we start at the beginning: with his extensive selection of bars. Most Americans will not know the name Pierre Marcolini: he is a true boutique chocolatier, a Belgian patissier who expanded into making his own chocolate from raw bean. A young man who began with one shop in Brussels, he immediately rose to rank with the greatest chocolate houses in the world—large companies with worldwide distribution like Valrhona and Michel Cluizel. Yet, if you did not know Pierre Marcolini from his shops in Belgium or the satellite shops in London, Paris, Moscow and Tokyo, you would not likely come across his chocolate. Fortunately, a New York City shop opened in 2005 at 485 Park Avenue (between 58th and 59th Streets). Today, I tried the Vénézuela 72% cacao bar, and I have some suspicions that this is Sur del Lago¹. Even before tasting it, I had a slight feeling: the dark brown, almost black color and the dark aroma of coffee, nuts, cocoa, and vanilla certainly aroused my interest and indeed my taste buds. Such a promising aroma surely couldn’t lead to a disappointing flavor, could it? Well, first the snap: clean, crisp, and even. Now for flavor. I popped some in my mouth. 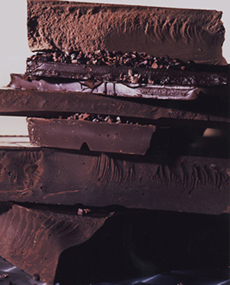 Immediately, this chocolate has a very dark tone², one that is neither subtle nor gentle. The flavors start off with a brief cashew and almond nuance, and then coffee comes in swiftly, leading to a lovely combined flavor of cream and hazelnuts. Slight tones of cinnamon and nutmeg enter the picture too. All this is eventually underscored by a pink floral tone accompanied by strawberries, both of which seem to “lighten” the dark picture that this chocolate is painting in my mouth. Indeed, it’s an interesting contrast—one that accentuates and complements rather than battles or exists in defiance. All these flavors finally dissolve at the end of the length into a pure coffee flavor that lasts well into the finish. The finish has a slight bitterness and is actually quite short, but this is extremely dismissible and adds no negative value to the chocolate whatsoever. The texture is slightly thick in the mouth but still rather enjoyable. Overall, it’s an excellent chocolate that has typical flavors associated with Sur del Lago. The pink floral and strawberry tones lend a unique gentleness to this otherwise assertive and dark toned chocolate. The impression I get while eating this is that of a dark chocolate version of Nutella with a splash of strawberry jam. How can you go wrong with that? Dark, bold, and full-bodied: if you like your chocolate dark, and I mean dark, this is your bar. Vénézuela Bar Summary: Dark-toned, bold, and assertive; a very masculine chocolate with robust flavors of hazelnut and cream, finishing with pink floral tones, strawberries, and coffee. Refreshing bitterness at the end. ¹Since Venezuela has so many distinct growing regions, flavors vary tremendously and are prized for this. Sur del Lago is a blend of Trinitario and Criollo beans and has typical flavors of pure cocoa, red fruits, and a very dark tone. ²A dark tone is analogous to French Roast coffee—full-bodied flavor with pure cacao strength. Note: it’s a tone and not a flavor. A fruity bean can possess a dark tone if roasted too long and if combined with more robust and darker-toned beans.